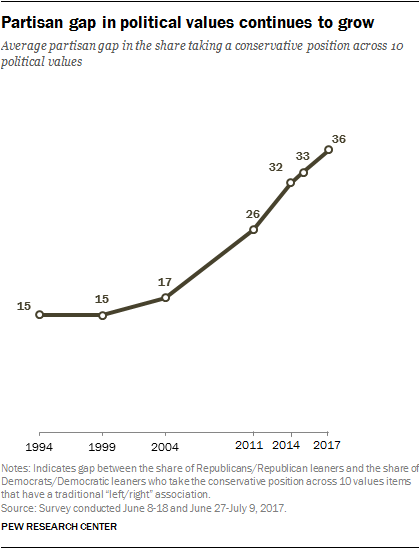 The gap between the political values of Democrats and Republicans is now larger than at any point in Pew Research Center surveys dating back to 1994, a continuation of a steep increase in the ideological divisions between the two parties over more than a decade. The subsequent chapters explore Americans’ attitudes across individual political values and policy issues, in most cases including data dating back to the late 1990s or early 2000s. In nearly every domain, across most of the roughly two dozen values questions tracked, views of Republicans and Republican-leaning independents and those of Democrats and Democratic leaners are now further apart than in the past. While the overall partisan gap across a variety of political values has steadily grown, the dynamic underlying the growing gap differs across issue areas. In some cases, the gap has grown because the parties have moved in different directions, with growing shares of Democrats taking liberal positions and increasing shares of Republicans taking conservative positions. But in other areas, shifts are greater among one set of partisans than another. In a few issue areas, notably views of homosexuality and of immigrants, public opinion in both parties has clearly shifted in a more liberal direction over the past several decades. 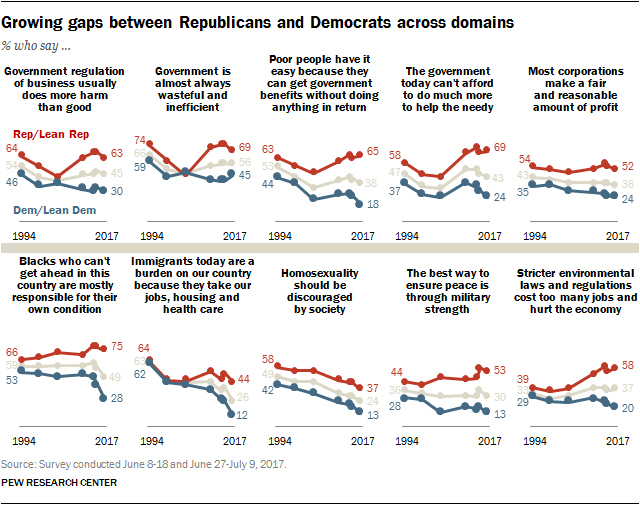 Nevertheless, the partisan gaps on both of these values have gotten wider over the past two decades, as the long-term shifts are more pronounced among Democrats than Republicans. The 10 political values questions shown above have been asked together in surveys seven times since 1994. On average, there is now a 36-percentage-point difference between Democrats and Republicans across these questions. The current gap represents a modest increase in the partisan divide over the past two years (from 33 points in 2015), but it is substantially wider than two decades ago (the gap was just 15 points in 1994). Looking at the identical set of items over more than two decades provides a picture of a growing partisan divide. 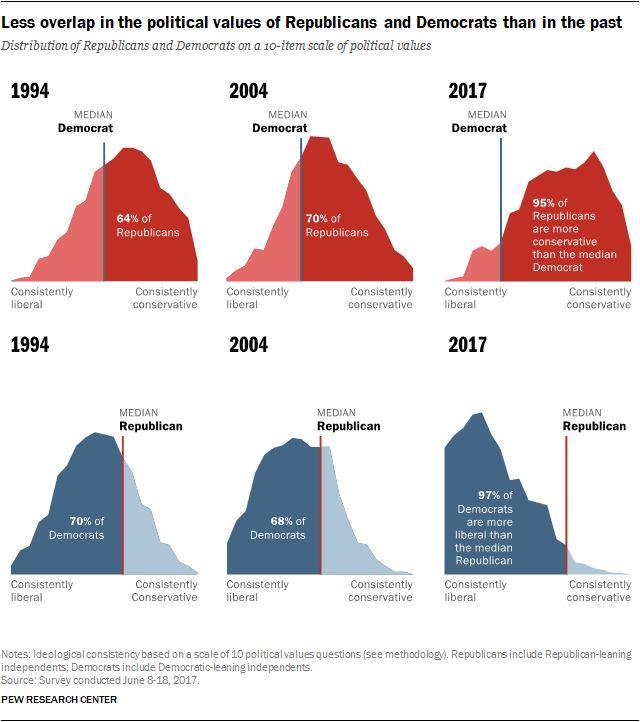 While this analysis is limited to questions consistently asked together going back to 1994, other political values and policy questions that have long trends show a similar pattern of growing partisan divides. For example, a question about whether Islam is more likely than other religions to encourage violence among its followers is not included among the 10 measures asked since 1994 (it was first asked in 2002). But partisan differences in these attitudes have increased steadily over the past 15 years. What was an 11-percentage-point difference on this question in 2002 now stands at 40 percentage points. And a question about whether it is more important to control gun ownership or protect gun rights – first asked in 1993 – shows a similar trend of widening differences. It is important to note that while members of the two parties have grown further apart over the past two decades, this does not necessarily mean there has been a rise in politically “extreme” thinking among either Republicans or Democrats, as Pew Research Center’s 2014 study of political polarization found. The extent of the partisan divide across the 10 political values far exceeds divisions along basic demographic lines, such as age, education, gender and race. Even so, some of these divisions also are somewhat wider than in the past. For instance, on average, there is now a 10-percentage-point gap between Americans ages 50 and older and younger Americans on these questions. That average difference was 6 points in 1994. And the average gap between those who regularly attend religious services and those who do not has roughly doubled over the past few decades, from just 5 percentage points in 1994 to 11 points today. 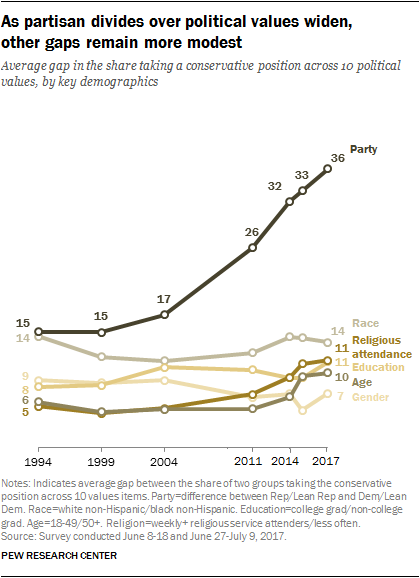 To some extent, the growing gaps within these demographic groups reflect the increasing degree to which these demographics are associated with partisanship. Using these 10 questions to create an ideological scale provides another way of illustrating changes in the public’s political values, and a growing divide along partisan lines. Overall, although many Americans continue to hold a mix of liberal and conservative views across different issue areas, that share has declined over time. At the same time, the center of the scale has shifted in a somewhat liberal direction over time. To a large extent, this is the result of the public’s growing acceptance of homosexuality and more positive views of immigrants, shifts that are seen among both Democrats and Republicans (GOP attitudes about immigrants are little changed over the last decade, but Republicans are substantially less likely to view immigrants as a burden on the country than they were in the 1990s). What is the ideological consistency scale? This scale is composed of 10 questions asked on Pew Research Center surveys going back to 1994 to gauge the degree to which people hold liberal or conservative attitudes across many political values (including attitudes about size and scope of government, the social safety net, immigration, homosexuality, business, the environment, foreign policy and racial discrimination). The individual items are discussed at the beginning of this section, and additional details about the scale can be found in the methodology. 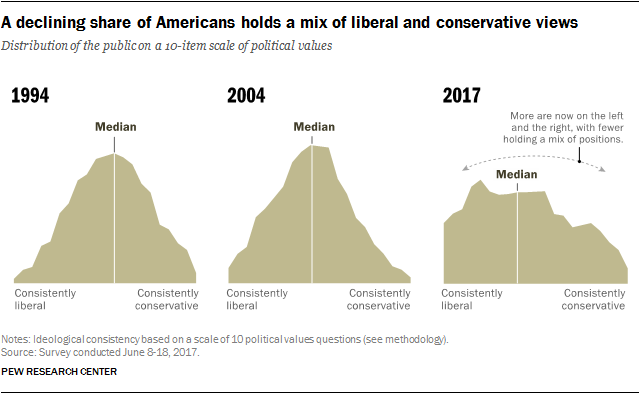 Where people fall on this scale does not always align with whether they think of themselves as liberal, moderate or conservative. The scale is not a measure of extremity, but of consistency. 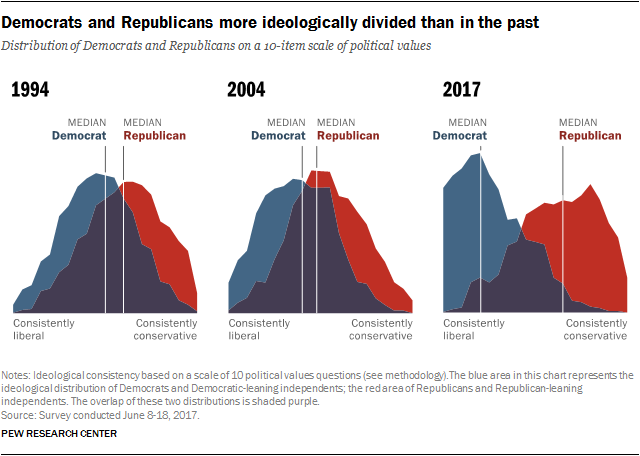 Reflecting the growing partisan gaps across the 10 questions (even those where both parties have shifted in the same direction), Republicans and Democrats are now further apart ideologically than at any point in more than two decades, a continuation of the trend Pew Research Center first documented with these measures in 2014. For instance, overall, on this scale of 10 political values, the median (middle) Republican is now more conservative than 97% of Democrats, and the median Democrat is more liberal than 95% of Republicans. By comparison, in 1994 there was substantially more overlap between the two partisan groups than there is today: Just 64% of Republicans were to the right of the median Democrat, while 70% of Democrats were to the left of the median Republican. Put differently, in 1994 23% of Republicans were more liberal than the median Democrat; while 17% of Democrats were more conservative than the median Republican. Today, those numbers are just 1% and 3%, respectively.